Monet and Abstraction aims to explore the crucial but still little studied role of this great Impressionist painter in the development of abstract painting after World War II. The exhibition takes the form of a survey of the artist’s work, from his ethereal landscapes to the monumental depictions of his garden at Giverny where he spent the last twenty years of his life. Through these works the exhibition will analyse how Monet’s ongoing obsession with capturing a sense of the instantaneous led him to break down pictorial representation to a mood of near abstraction. While his painting was considered anachronistic by the avant-garde trends that prevailed in the early decades of the 20th century, around 1950 Monet was rediscovered by the young American and European abstract painters, who elevated him to the status that he currently enjoys within the history of art. 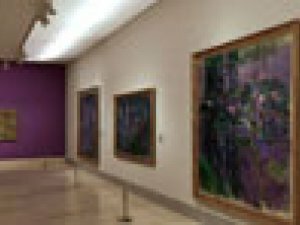 Monet’s works will be displayed in the rooms of the Museo Thyssen and at Fundación Caja Madrid alongside paintings by Jackson Pollock, Mark Rothko, Willem de Kooning, Sam Francis, Joan Mitchell and Gerhard Richter, among others, offering the visitor the chance to appreciate at first hand the connections between them.